More Chicken Tomato Masala, We want more! is the message I have been given by my friends. I recently made a few of them this dish as take-homes, and was informed, that I need to make them more Chicken Tomato Masala. I even heard the tales, that they were using their fingers to swipe the last remnants of the sauce from the container and plates! So it’s not only me, who found this dish deliciously more-ish and yummy-licious!!! Marinade the chicken pieces, in the yoghurt, garlic & ginger. Preferably overnight, otherwise an hour will suffice. In large pan or pot, heat up the butter & oil. Once butter has melted add the garlic and ginger and cook until slightly brown. Add the tomotoate paste, and cook until it has darkened in color. Now add the paprika & gram masala, mix well. Add the tomatoes, salt and water. Bring to boil, and turn down to let it gently simmer for 20minutes. In your oven, preheat your grill section (together with oven on to 180 degree’s celsius). Put the pieces of chicken on a baking tray and grill both sides, until nice and crispy. In the saucepan, I also add the marinade that is left from the container the chickens were marinading in! I use a hand blender to blitz the entire mixture to make it smooth and not chunky from the tomato’s, but the choice is yours! Remove the chicken from the oven, and put into the sauce; simmer and cook for a further 15-25 minutes, until chicken is completely cooked through. Add the cream and roughly chopped fresh coriander (quantity is dependent on whether you like having this herb in your food or not), stir and serve! Serve with cauliflower rice or with a cauliflower wrap! 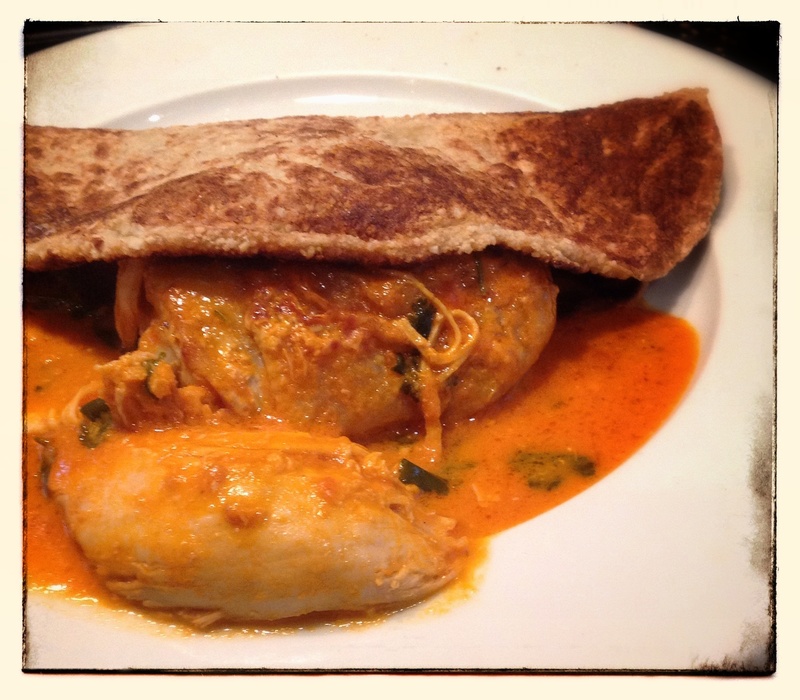 This entry was posted in LCHF recipes and tagged Atkins, banting, chicken tikka masala, chicken tomato masala, garam masala, LCHF, tikka masala, tomato paste by angelb38. Bookmark the permalink.